It’s a continuing mystery to me why regulation of industry is so widely and casually disparaged. Then something happens like the collapse of the US banking industry, or a mine explosion, and there’s talk briefly of adding regulations or enforcing them more strictly, but soon it’s back to depicting regulations as yet one more evil government tool to take over free enterprise and steal our freedoms. Mind you, many of the people saying this don’t seem to mind at all when our government gets serious about stealing our freedoms, whether by reading our email without court approval or throwing us in jail without paying attention to habeas corpus. Companies just don’t like regulation, and Don L. Blankenship, the chief executive of Massey Energy Co., has a history of challenging the regulators in every way he can. 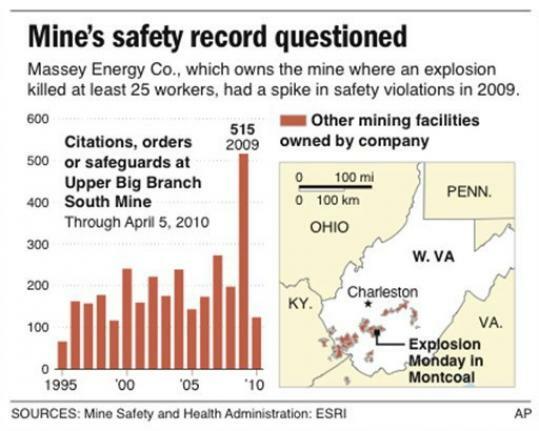 Massey’s Upper Big Branch Mine has been cited for safety violations 1,342 times since 2005. Eighty-six of those citations involved failing to follow a mine ventilation plan to control methane and coal dust, 12 of them coming last month alone. Not surprisingly, Blankenship views this as the cost of doing business. “Violations are unfortunately a normal part of the mining process,” he said in a radio interview with West Virginia Metro News. “There are violations at every coal mine in America and UBB (Upper Big Branch) was a mine that had violations.” . . .
Only after disasters such as this one do we remember that regulations exist for a reason, that their enforcement can, literally, be a matter of life and death. We will eventually learn what went wrong at Upper Big Branch and whether the safety violations were part of the problem. But then what will we do? As for banking regulation, the moment seems to have passed. I don’t see the Senate doing anything.